Durif (also known as Petit Syrah), is a flavoursome and robust variety that excels in warm and dry conditions. Durif was developed by Dr Durif, a French nurseryman living in the south of France in the late 1870s. He crossed the Syrah grape with the Peloursin variety and the resulting grape was named after him. Durif was common in the southern French regions of Languedoc, Provence and Vin de Pays though it is rarely seen today. Dr Durif was experimenting to breed a grape with natural resistance to powdery mildew however, the new material formed very tight bunches so it did not perform well in its native France and is now rarely grown there due to disease pressure. However, it is a popular variety in California and is widely blended into a number of red wines. Today, a number of wineries are producing Durif as a varietal in its own right and there is quite a resurgence in the popularity of the wine. The Rutherglen region in Victoria is well known for its Durif and the variety is being grown successfully in other Australian regions. The wines made from Durif are usually firm, full-flavoured wines rich in tannin. Depending on the style that the winemaker chooses, the wines can vary from soft and short lived to very robust and flavoursome and able to age for a decade or longer. Durif wines are always more enjoyable when served with hearty foods such as roast beef, stews and full-flavoured, mature cheeses. 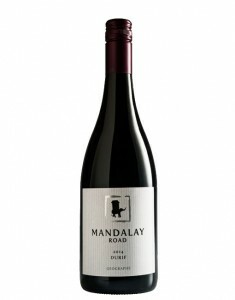 Mandalay Road Durif is at the robust and flavoursome end of the Durif spectrum. Drinking well now it will age spectacularly! For more information of Durif in Australia read this article by Dan Traucki for Wine Business Magazine. 254 Mandalay Road, Glen Mervyn. WA 6239. To sell or supply liquor to a person under the age of 18 years on licensed or regulated premises. For a person under the age of 18 years to purchase, or attempt to purchase, liquor from licensed or regulated premises in person or through online merchant facilities.